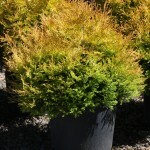 A slow growing, globe shaped shrub with rich, golden-yellow foliage. Color turns coppery in winter. It needs little to no pruning. Best in full sun but appreciate some light afternoon shade in hot summer areas. It performs best in a moist, well-drained soil, but is tolerant of other conditions except dry.